Student Eligibility -- Modify Your Notification Letters - ..:: Region 1 > Meals Plus > News You Can Use ::.. This screen allows you to customize your Student Eligibility letters. Click Next. It will open in a screen similar to a word processor. The ampersands (&) in the letter text indicate where it will insert information from the database. The dollar signs [$] in some of the Verification Results letters are place holders where you need to enter meal prices into the letter template before the letter is run. Any of the fields listed in the Available Fields dropdown may be inserted into the letter from the database. All letters allow the same 25 available fields to provide a uniformed look to the letters; however, some letters made have additional fields available. Position the cursor at the place where you want to insert the field. Select the Field from the dropdown list. Then click Insert. To use the formatting toolbar, use the mouse to select the area you want to edit and then click an icon in the toolbar. Include the ampersands if you are formatting one of the inserted fields. Use the Margin button to reset the margins. 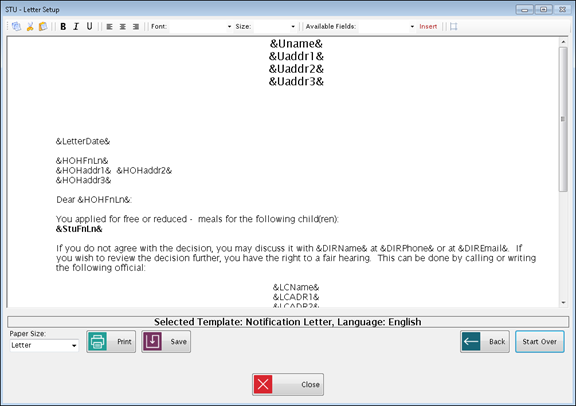 Select Letter (8 ½ x 11) or Legal (8 ½ x 14) from the Paper Size dropdown list. Click to see a preview of your letter format. From the preview screen, you can use the Zoom icon to enlarge it or the printer icon to print it. When a letter is printed, a prompt will appear asking the user if they want the letter information added to the letter history. Click when you are finished editing. 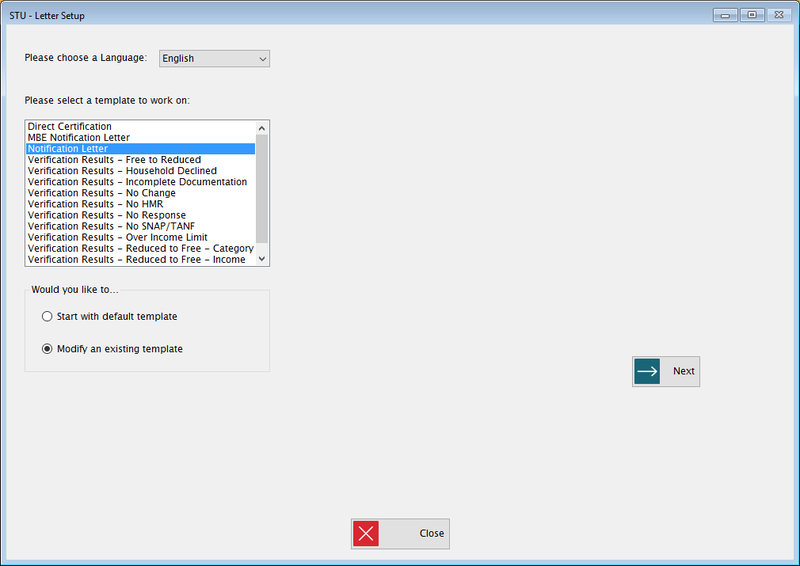 This screen allows you to customize the phrases that will be used in notification letters to explain the status codes. The text shown on this screen will be automatically pulled into the letters as they are printed. Highlight a Language to select it. Select the Notification or MBE tab for the type of letter to create. The text fields will automatically populate with phrases but they can be edited. Sample phrases for English and Spanish are supplied with the product. For all other languages, English text is used by default. You will need to supply the equivalent phrases for any additional languages. To edit the phrases, enter new information in the text fields and click Save.